There are so many different ways to explore Gettysburg. The Civil War history, of course, is what initially put Gettysburg on the day trip map, but as this blog has pointed out before, there's so much more to Gettysburg and its surrounding environs than its battlefields. 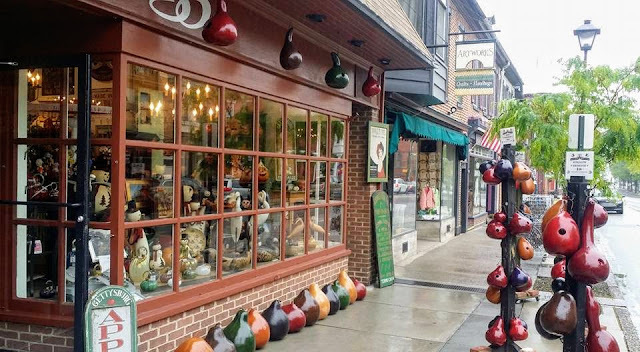 Gettysburg offers a (surprisingly) wonderful food scene, a culinary experience that combines the best of food, wine, and history in a range of price points.There are a number of ways to explore culinary Gettysburg, but a fun -- and perhaps the best -- way is to take a Savor Gettysburg tour of local restaurants. Of course part of the food tour is the local history. Savor Gettysburg owner and tour guide, Lori Korczyk, gave us a fantastic introduction to the local buildings and people during the Civil War era, but I'll leave that for you to discover. Of course, Gettysburg and Adams County are also well known for agritourism, with its orchards, farm stands, and vineyards. Now, local restaurants are increasingly taking advantage of the proximity of these local food sources to provide a real, from-farm-to-table experience for diners. Food 101's Fennel Sausage and Broccolini Pizza. 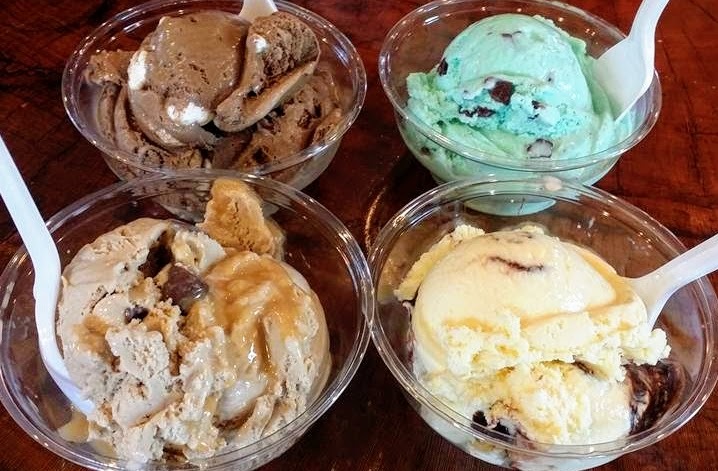 During the tour, we got to experience dishes that ranged from traditional Irish shepherd's pie to the best in local freshly-made, hand-dipped ice-cream. 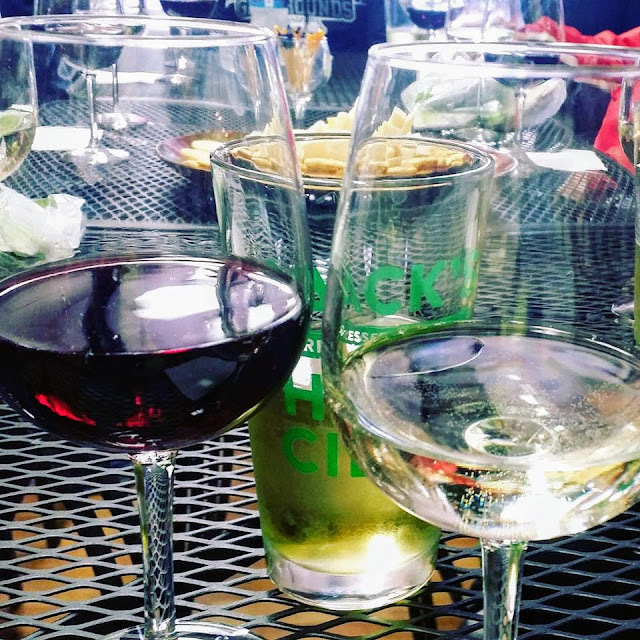 We sampled wine and hard ciders, sampled soups and tacos and some memorable mac and cheese from an array of ethnic eateries, historic taverns, family owned bistros and wineries in what amounted to a progressive meal, which wrapped up with drinks and dessert. Chef Corey Williams in the dining room of Food 101. The tour began at Food 101, serving fine American cuisine at 101 Chambersburg Street, with a slice of the restaurant's Fennel Sausage & Broccolini Pizza and zeppolis with a raspberry sauce. Chef Corey Williams' menu is built around reasonably priced salads, sandwiches, and artisan pizzas, making the restaurant popular with the local college crowd. You can find a comfortably familiar Caesar Salad, but there's also the intriguing Asparagus & Bacon Salad and the Berry Almond Salad. This, actually, was my third visit to Food 101, and I've yet to be disappointed. 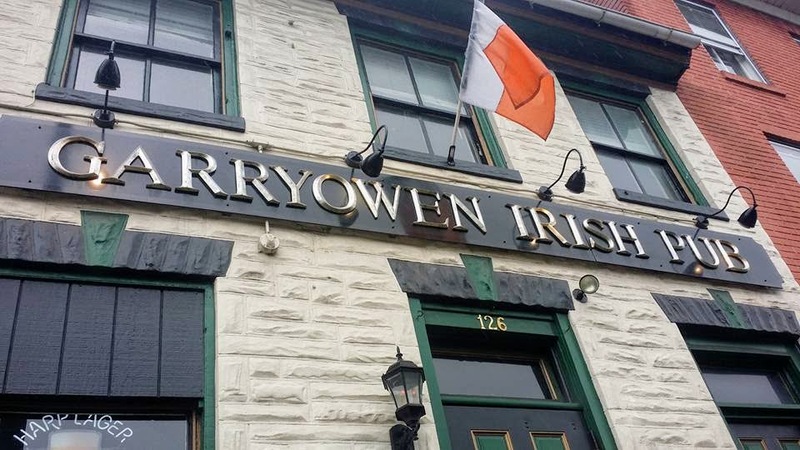 Our next stop was just a block away at the Garryowen Irish Pub, located at 126 Chambersburg Street, and owned by Kevin and Joanne McCready, originally from County Armagh, Ireland. The menu offers a variety of traditional Irish food -- Shepherd's Pie, which we sampled (and yes, it was amazing -- this is a destination restaurant), as well as Banger's and Mash (Guinness and onion sausages over seasoned redskin mashed potatoes and sauteed onions in a rich brown gravy) and Traditional Ulster Fry (grilled Irish bacon and sausages, black and white pudding, and homemade soda bread, served with fried egg and grilled tomatoes), among others. Cider made exclusively for Garryowen Irish Pub by Hauser Estate Winery. A significant portion of the tour is the walk between food establishments, during which Lori (our tour guide and the owner of SavorGettsburg) provided interesting tidbits about the town's history and features. We made our way over to One Lincoln Food & Spirits for a dreamy crab mac and cheese, located at 1 Lincoln Square, in the Gettysburg Hotel. Chef Joseph Holmes specializes in taking classic comfort food -- in this case, a standard macaroni and cheese -- and modernizing it in taste and presentation (macaroni noodles in a creamy crab béchamel sauce with herbed brioche croutons). Instead of a classic BLT, there's a Grilled Chicken BLT (on a brioche bun with smoked gouda cheese and pepper mayonnaise served with fries). Our last "main course" food stop was El Costeno, at 39 York Street. Arturo Guinto, owner and chef, is focused on offering fresh, authentic Mexican cuisine based on family recipes from his home in Acapulco. We tasted the chicken fajita and carnitas (slow simmering pork). Arturo Guinto, owner and chef of El Costeno, chats with the tour-goers as we sample El Costeno's offerings. 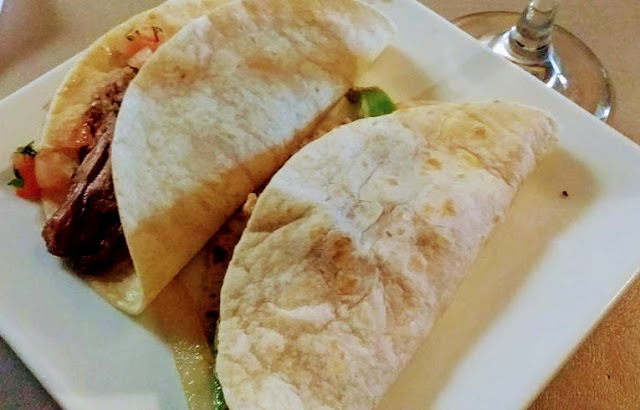 In addition, the menu offers the expected burritos, enchiladas and chimichangas, but there's also the less expected Burrito Toluca (grilled chicken breast and chorizo sausage) and Chicken Guerrero (chicken breast topped with creamy spinach and bacon sauce). And the menu implies a sense of humor -- you can order Burrito Popeye (stuffed with chicken, mushrooms, spinach, and onions). The menu also offers a variety of fish dishes (Camarones a la Diabla, Chimichango del Mar) and steak dishes (Lomo Saltado, Steak a la Mexicana). So yeah. We'll have to come back! With our tummies already satisfactorily full, we made our way back to the main square to Hauser Estate Winery to sample two wines -- Hauser's Jenny Wade (a vidal white) and Devil's Den (an oaky rich red) and Helene's Hard Cider. Along the way we got to know the other tour goers -- even making some friends we hope we'll see again -- all whilst enjoying a smattering of local history as we walked the historic streets, met several of the chefs and owners of the restaurants, and experiencing amazing food! The cool thing is the opportunity to "sample" a variety of restaurants in pretty much a risk-free way -- you're not committing to a full-fledged meal at any location. Although each sample is not in itself very large, the tour serves enough food so that lunch afterwards is not necessary -- and in fact, we still were not hungry at dinner time later that day. You will leave, as the tour promises, "comfortably full" at the end of the tour. Hand-dipped ice cream from Mr. G's Homemade Ice Cream. This tour is great as a romantic date, a double date with another couple, or to experience with a small group of friends. It's a mix of trying new food (and wine and hard cider), walking, and some history, and a lot of opportunity to chat with each other along the way. 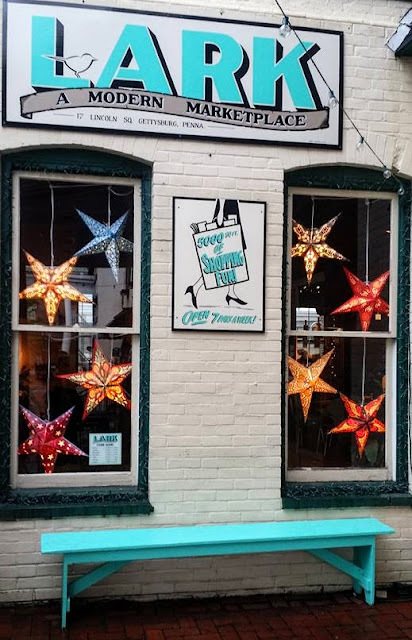 Before the tour, or afterwards (or both), be sure to stroll around the historic town area, browse the boutiques, and enjoy the town's quaint and friendly atmosphere. Yes, come to Gettysburg for its Civil War history, but definitely plan to stay for dinner (or breakfast or lunch)! Know before you go: Tours are held rain or shine. Keep in mind that food tastings are held inside each food establishment. Please make sure to check the weather conditions for your tour day and dress accordingly. In the case of inclement weather, dress appropriately and don't forget your umbrella! Getting there: Savor Gettysburg tours will send you meeting time and place. Hours: Check the website for dates and times the restaurant tours are offered. For other day trip destinations in and around Adams County, go to the Blog's Find a Great Place to Day Trip or click on the Gettysburg or Destination Gettysburg label below.